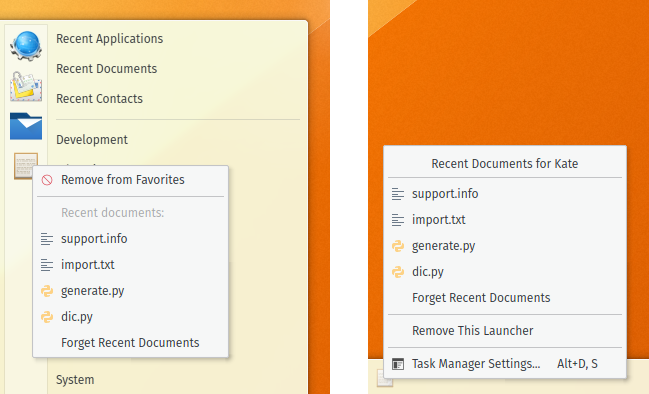 Technically speaking we've had per-application recent docs since at least KDE 2 (our file dialogs remember recently opened files), but exposing them in app launchers in specific ways can well have popped up in other desktop shells before. We don't claim good ideas as being KDE's exclusive domain :). In the end what matters is what brings value to our users. It's made possible by an improved system to store and retrieve that information, which is one of the main thrusts of that post: We can implement features that make use of recent files or events in arbitrary UI very easily now. Bushan Shah's post on using the query API in Plasma Media Center is a nice example. would it be possible to have a recent folder tab. Ehen you work for one project I would use always a few folders where I open and save files. to have recent folders would be great for open and save dialog and also for Dolphin. We could use the Activities backend to experiment with functionalities like this, yep!